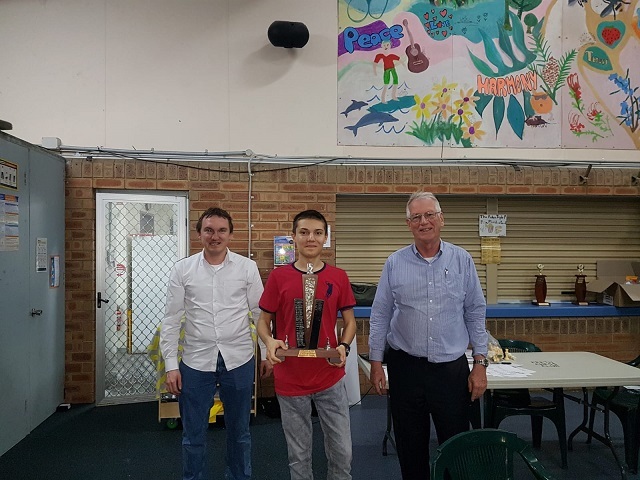 The 2018 WA Lightning Championship was held at Perth Chess Club (North Woodvale Primary School) on Sunday 23rd September. We were fortunate to have our local GM-elect Temur Kuybokarov participate, following his successes in the 2018 Gold Coast Open (which he won ahead of several strong GMs, securing his third and final GM norm) and more recently, a very strong performance in Abu Dhabi. Congratulations to IM Temur Kuybokarov -- 2018 WA Lightning Chess Champion. Temur's picket-fence score (11.0/11), was particularly impressive given the strength of the field. Finishing 2nd with 8.0/11 was FM Patrick Gong; 3rd place was shared between FM Tristan Boyd, Ihsan Ferozkohi and 2018 WA Junior Champion Brent Geronimo (7.5/11). Congratulations to WFM Kathryn Hardegen (6.5/11) -- 2018 WA Women's Lightning Chess Champion. Congratulations to Alex Janceski and Craig Kinsman -- 2018 WA Seniors Lightning Chess Champions. After both players finished the tournament on 6.0/11, participants and spectators were treated to a 2-game playoff. While Alex won the first playoff game, Craig was able to level the score in the second game. Consequently the title was jointly awarded to both players. In the Under 2000 rating category, 1st prize was won by Brent Geronimo (7.5/11), with Ben Dagza and Ross List sharing 2nd (6.0/11). The under 1500 rating prize was shared by 4 players on 5.0/11: Oscar Gao, Alistair Berry, Jamie Laubbacher and Alex Pimenov. A steel chess-themed fire pit, kindly donated to CAWA by Marc Vlietstra, was awarded as a `Biggest Upset Prize' to the player who, in the opinion of the arbiter, achieved a significant upset win with the potential to change the tournament outcome. The fire pit was awarded to Nedeljko Tomic (1789), for his Round 1 win over FM Tristan Boyd (2414). It took a few rounds for some players to get used to the new Fischer time control (3 minutes plus 2 seconds per move). Feedback suggests that the increment is preferred, and in my view, the quality of the games played supports this. CAWA has adopted this time control for future WA Blitz Championships. The new rule regarding illegal moves (a player's first completed illegal move no longer loses immediately, but results in a 1 minute time bonus to the opponent) requires some extra work for the arbiter to implement -- again, however, feedback from players suggests that the rule change is popular. As is always the case in blitz, some difficult rulings were required, so I thank all players for their cooperation and for accepting my rulings in good spirit. Thank you to CAWA President Alan Wolstencroft and my wife Kathryn for their help on the day, which enabled the tournament to run as smoothly and successfully as it did.